One of the strangest close encounters of the "airship era" took place 101 years ago, on May 6, 1897, near Blue Ouachita Mountain, just northwest of Hot Springs, Arkansas. Constable John J. Sumpter Jr. and Deputy Sheriff John McLemore of Garland County left Hot Springs on horseback to investigate reports of cattle rustling. They rode north on what is now Highway 7 to Jessieville. "While riding northwest from this city (Hot Springs) on the night of May 6, 1897, we noticed a brilliant light high in the heavens. Suddenly it disappeared and we said nothing about it, as we were looking for parties and did not want to make any noise." "After riding four or five miles around through the hills, we again saw the light, which appeared to be much nearer the earth. We stopped our horses and watched it coming down, until all at once it disappeared behind another hill. We rode on about half a mile further, when our horses refused to go farther." "Almost a hundred yards distant we saw two persons moving around with lights. Drawing our Winchesters--for we were now thoroughly aroused as to the importance of the situation--we demanded, 'Who is that, and what are you doing?'" 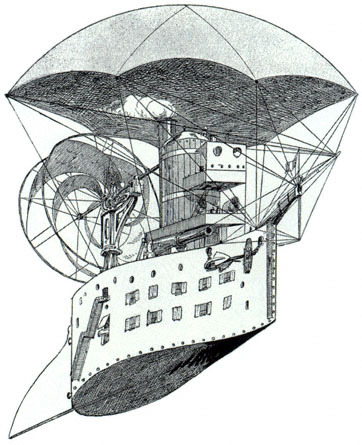 "A man with a long dark beard came forth with a lantern in his hand, and on being informed who we were, proceeded to tell us that he and two others--a young man and a woman--were traveling through the country in an airship." "We could plainly distinguish the outlines of the vessel, which was cigar-shaped and almost sixty feet long, and looking just like the cuts that have appeared in the papers recently." "It was dark and raining and the young man was filling a big sack with water about thirty yards away, and the woman was particular to keep back in the dark. She was holding an umbrella over her head. The man with the whiskers invited us to take a ride, saying that he could take us where it was not raining." "We told him we preferred to get wet." "Asking the man why the brilliant light was turned on and off so much, he replied that the light was so powerful that it consumed a great deal of his motive power. He said he would like to stop off in Hot Springs for a few days and take the hot baths, but his time was limited and he could not. He said they were going to wind up at Nashville, Tennessee, after thoroughly seeing the country. Being in a hurry, we left, and upon our return, about forty minutes later, nothing was to be seen. 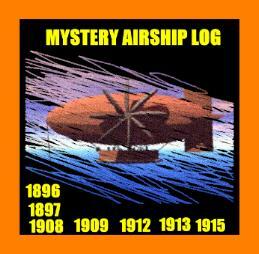 We did not hear or see the airship when it departed."